Orphaned as a child and hidden from the world, 23-year-old Willow’s life is ordinary. Until a stranger comes into her life forcing her to recount past memories she thought she had suppressed and speaks of a destiny she cannot accept. Fueled with regret and a looming fear of the unknown, Willow must make a choice. Save the world or save herself. There’s just one problem; she’s been infected. As I read the abrupt ending of this book, I silently cursed Matthew Thrush. I know there's a second book, but geesh...it ended hard. Thrush is a vivid story-teller. He paints not just a picture of the story but of his characters. Descriptions of horrific scenes are balanced perfectly between appropriately cringe-worthy and cinematic "too much." (His descriptions alone make me want to see this in the movie theater.) His characters are beautifully developed. Willow is intense, still a teenager, but clearly functioning in a world we really can't imagine. She's sharp, witty, and honest---just what teenagers in any society should be. The people she encounters are vivid, but not overpowering, she's definitely the star of the show. From line one, you're involved in the story. 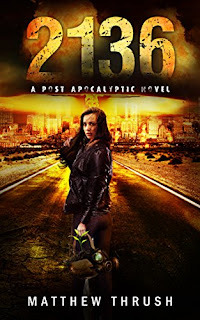 It's an apocalypse story that is plausible and frighteningly so. 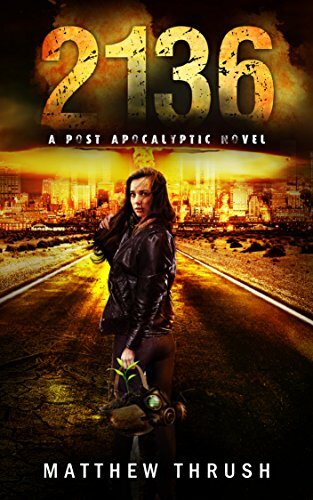 It's good and evil, coming of age, and dystopia all rolled into one. It's been a long time since I kept myself up late to read one more chapter...but I did with 2136. And I'm kinda ticked I'm stuck waiting for the next book!